My sister and I moved on from Annapolis to Baltimore's Inner Harbor, or as what I see as the Times Square of Maryland. As beautiful as the waterfront area is, it is no doubt a flocking point for tourists without the serenity of Annapolis. However, within our time of touring with exhaustion and intense heat, we happened upon Fell's Point, an unexpectedly lovely area with history dating back to the 1700s. Hidden in this neighborhood are streets similar those of Annapolis, with cobblestone roads and colorful homes. There is a welcoming, old-city vibe in this environment that takes modern-day Baltimore into a different and refreshing light. With temperatures at the extremes this past weekend, I opted for a bohemian-inspired look that is both convenient and comfortable. 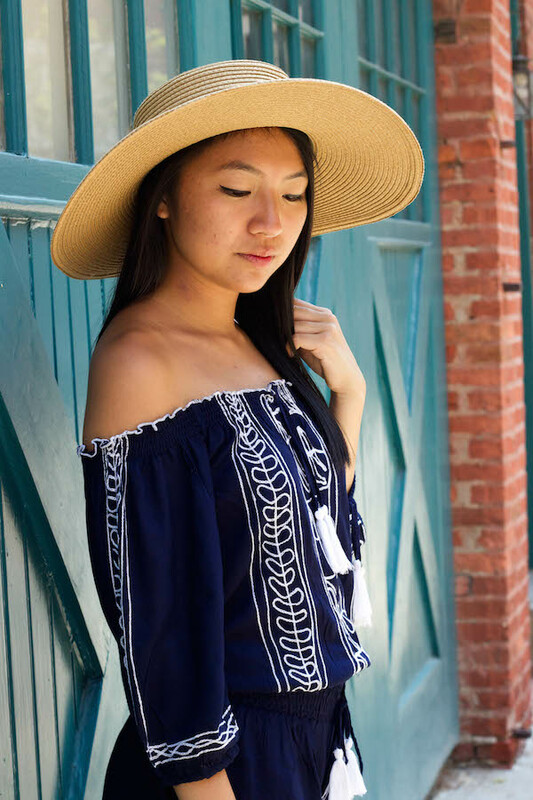 This embroidered romper is the perfect piece for a day of summer travel because of its lightweight material and breezy off-shoulder detail. The best part is not having to deal with those off-shoulder tops that refuse to stay in place -- perks of the romper silhouette. To top it all off (no pun intended), I paired the piece with an oversized boater hat for that ultimate summer vibe. If you're lusting over this romper as much as I am, check out more of Boohoo's fabulous collection here and use the code CHRISTINA30 for 30% off your entire purchase!